The annual extended family New Year’s Eve camping trip has come and gone again. 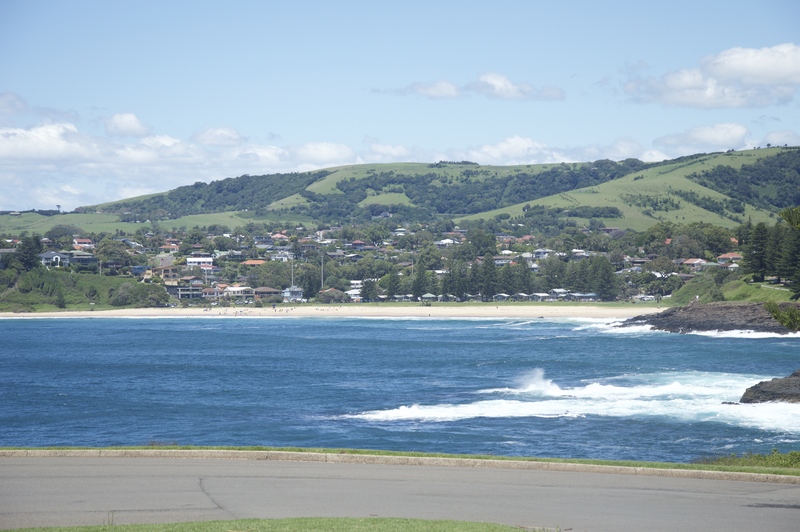 For the past seven years or so we’ve been heading down to the South Coast of NSW for a week to go camping. A few times we’ve extended it to a month (usually when Mum realises she has eight weeks off from work and doesn’t want to sit at home), but usually it’s just a standard week. 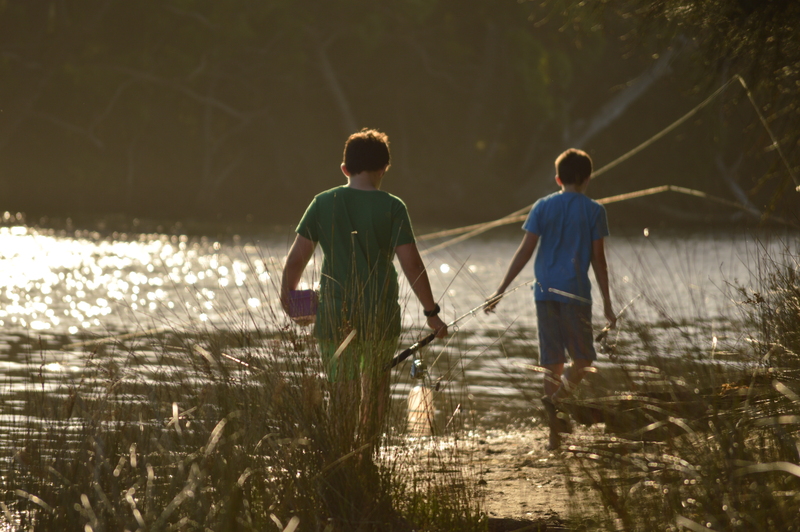 We’ve been a few different places down there – for four years we camped at Bendalong, a lovely little town (population 400) slightly north of Ulladulla. Then we migrated further south to Lake Tabourie, around ten minutes south of Ulladulla. So anyway, I didn’t go down on Sunday with the rest of the Tibeston crew due to work commitments. Which turned out to be a good decision – it rained for the ENTIRE DAY. Mum told me later that the queue of caravans down Mount Ousley travelled at around 20km, many with their hazard lights on due to the fog and rain. Upon arrival, the sites were mud. Churned up, disgusting mud. First stop was to the shops to buy some tarps to cover the sites, so that we could actually walk around them. When we spoke to some fellow campers (sufferers? ), they told us that a bikie gang had been camped there for a month before us. That’d be right. 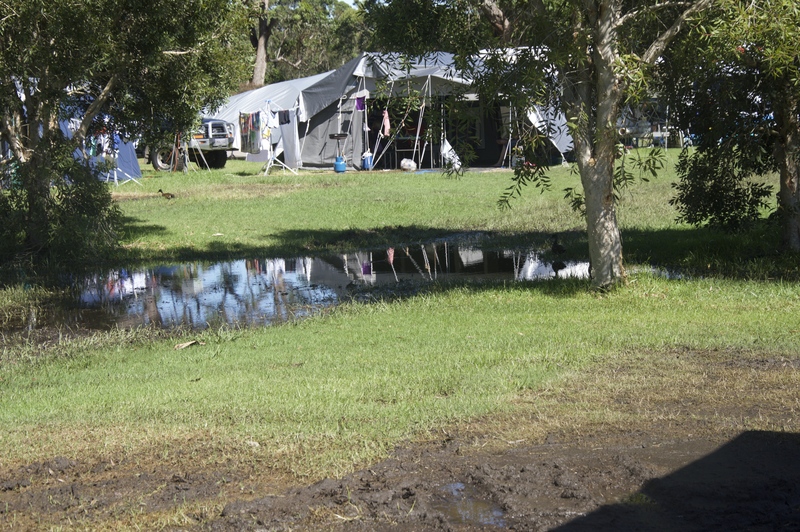 To put the nature of our sites into perspective, upon entry the caravan park was offering people the chance to change sites if they were unusable. Ulladulla had their largest downpour in forty years two days before we arrived. Ducks were swimming on our site. People were being put into cabins because the campsites were literally untenable. Except for us of course. Because we weren’t in tents, they figured we’d be fine on our sites – apart from the fact that we sank into the ground every time we walked, we probably were better off than 80% of the people in the park. Luckily on Monday afternoon the sun arrived for a couple of hours. After shifting all of our gazebos so that our tarps could dry out, we headed to the beach. The surf was fantastic after all the rain, and we had a great afternoon with the cousins jumping waves and boogie boarding. 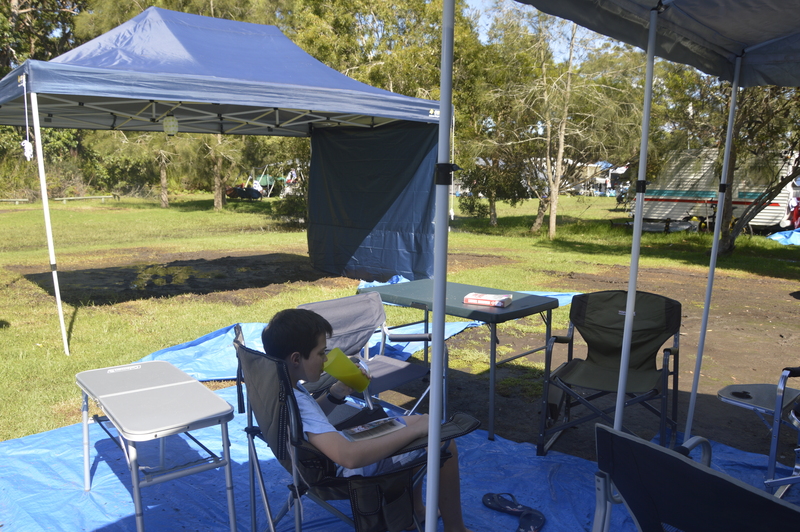 We had a couple of hours of sun on Tuesday as well – the boys all went fishing while we relaxed on the campsite. Every year while camping I develop a new skill. I never go down intending to do it, but it just happens. Last year I learned to crochet. This year, I discovered a cryptic crossword book in the depths of the caravan, and decided to teach myself. So I spent the morning solving a grand total of four clues on my crossword, while everyone else read books and relaxed. I had to head off on Wednesday because of work, and of course it was the sunniest day in the entire week. Around 30 degrees, clear with great surf. To make myself feel better I stopped off in Kiama to see the blowhole. Another year, the annual camping trip over. 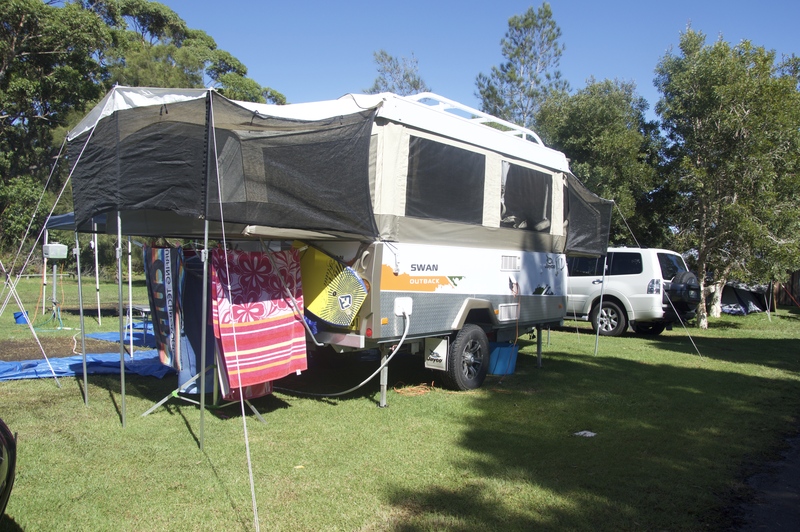 Mum and Dad have already booked us for a month in Umina in December. Hopefully it won’t rain as much and we’ll be able to walk around our campsites! Next The semester thus far….